FIRST 30 Photos- On the Water. Some Quick (very!!) photos of the NEW First 30 in her first sail. 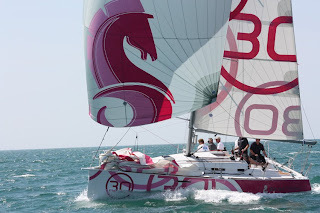 The exciting graphics, and fast design make this boat a real winner. Stay tuned. For more info visit the First 30 Designer blogsite. Got this Great Video from our Friends at Doyle Sails of HUGO BOSS just ruling the water off Land's End. Nice Sailing Guys- Nice Sails! The information on the new First 30 is starting to make it's way accross the Atlantic to the North American Dealer network in anticipation of her debut at the Annapolis Boat Show this October. 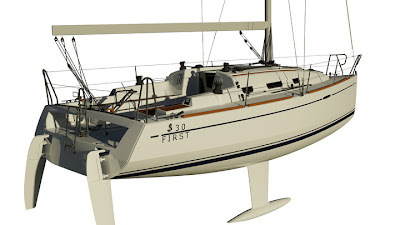 From the early renditions of the layout for the boat- her vivid graphics will surely be refreshing and have a radically different departure from the traditional look of a sailboat. The fuscia in these renditions is for demonstration only as we've been told that the North American versions will have a different color scheme than this. The First 30 comes along at a time when we are seeing a movement in the Sailing market that better defines performance oriented boats in the sub 32 foot range. With an emphasis on agile sailing, accessibility, performance and value- the First 30 is a welcome addition to the First 'stable' of winners. Brought to you by the #1 builder of boats worldwide -Beneteau and your Lake Michigan Platinum Beneteau First Series Dealer- Karma Yacht Sales. Stay tuned for details as they come out. If you would like to be placed on the VIP list for the Debut this fall, don't hesitate to contact us via the links below. BENETEAU is launching the new FIRST 30, designed by the talented Juan Kouyoumdjian, well known for his contributions in the America’s Cup and the Volvo Ocean Race. The new FIRST 30 by Beneteau combines the best of both worlds, Beneteau comfort and First performance. Coming soon to your Lake Michigan Beneteau First Dealer- Karma Yacht Sales. The sport of sailing is just like any activity that you undertake- comes equipped with it's own set of language and terminology that to the newcomer may sound like a 'foreign language'. In many cases, the learning curve can be steepened just by learning the jargon. One easy fix is to take a basic keelboat sailing course to learn the basics of boathandling and familiarize oneself with the terminology. This path is recommended for many reasons: it helps build confidence a 'hands-on' workingn knowledge of the boat. After that initial class, however there are different "dialects" that are used on boats to signify the basic working parts. This further complicates things. "SAILORSPEAK" a new book by Bob Roitblat does a good job of summarizing some of the commonly used terms into one easy reference book. 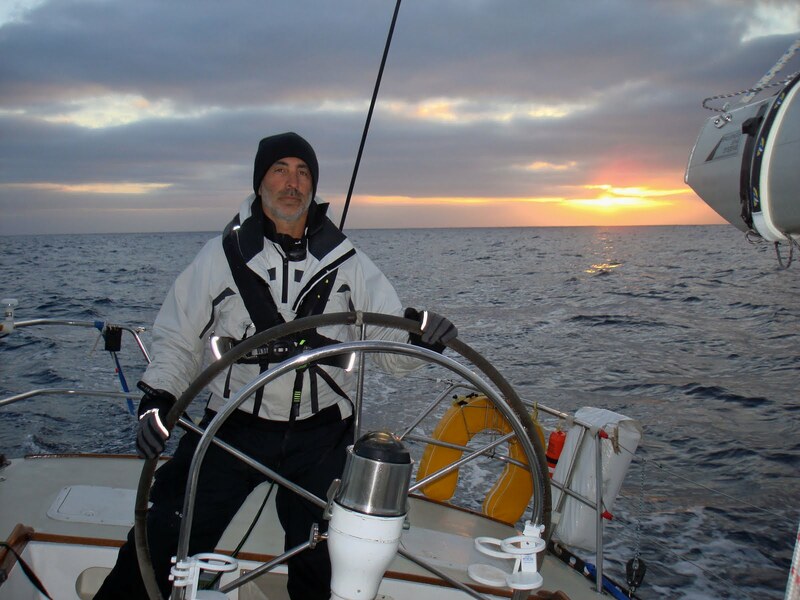 Bob has been racing in the Beneteau First 36.7 fleet aboard Steve Pelke's "Stingray" and has recently undertaken being an author. "SS" is is first entry into being a writer. KYS caught up with Bob to get his thoughts behind why he wrote SS and what his future plans are as an author. That interview is located below. KYS-Docktalk: Tell us a little bit about your sailing experience. BR: I started sailing at 16, but only got into racing about six years ago, somewhat by accident. It was late fall and I was in someone's office who had sailing memorabilia scattered throughout. When I asked him if he sailed, he said no, he raced. I mentioned that I'd like to try it, that racing could be fun. He invited me to join them for a day when racing started up in spring. My first time out on the race boat was a practice day. It seemed like that day’s agenda was designed to test just how much abuse I was willing to take. I must have passed the test, because I was invited to race the whole season. Since 2008 I’ve primarily raced with Steve Pelke on Stingray, and then on other boats when time permitted. Since I started racing, I’ve done all the local and Area Three races and several Macs-both flavors. I’ve also competed in other marquee races, such Key West, Manhasset Bay, etc. 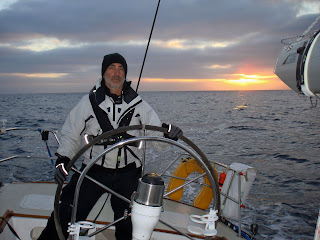 And last summer, Steve and I competed in the Transpac. KYS-Docktalk: What motivated you to write SAILORSPEAK? BR:Two years ago I was asked to coach a newly formed racing team. In an effort to get everyone concentrating on developing their skills instead of deciphering all the jargon we use, I created a glossary of jargon and slang. That project expanded and mutated until it became a book. KYS-Docktalk: For all the aspiring sailor/writers out there, Tell us about your journey for writing this book. How long did it take you? What did you learn? BR: It was never my intention to write a reference book. The original glossary took on a life of its own. As I talked with more and more people about their favorite slang terms, the glossary grew. As I researched the jargon used in one part of the Country compared to another, the glossary grew. I interviewed several sailing legends and read everything I could get my hands on and the glossary grew some more. By the fall of 2008 I had so much data that I decided to take a break from another project I was working on and create SAILORSPEAK. I have probably spent about 1,000 hours researching, writing and editing. Doing the research and compiling all the data has taught me more about sailing than I ever imagined. I also leaned a lot about the politics and mechanics of the book publishing industry. Maybe somebody should write a book on publishing terms, jargon and slang. I’d buy it. KYS-Docktalk: What’s next for you? Are you planning any other sailing related books? BR: When I can, I'll pick up where I left off on my other project: a book that uses the lessons learned from yacht racing and applies them to running a small business. That book lets me mix my avocation with my job. 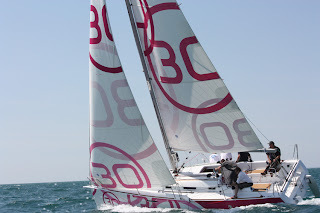 BENETEAU REVEALS THE NEW FIRST 30 BY JUAN K.
MARION, SC, June 18, 2010: BENETEAU is launching the new FIRST 30, designed by the talented Juan Kouyoumdjian, well known for his contributions in the America’s Cup and the Volvo Ocean Race. The new FIRST 30 by Beneteau combines the best of both worlds, Beneteau comfort and First performance. The First 30 is a performance boat with a high level of comfort for cruising due to the layout being conceived in collaboration with the interior design firm Nauta Design. Also worth noting are bulkhead recesses built into the bottom of the forward cabin lockers and at the front of the salon seating which allow full length providing good settee berths. An aft cabin and generous head compartment with shower complete the accommodations. Woodwork is light oak tinted Alpi retaining the FIRST rich attributes, such as solid wood moldings on the chart table and galley. On deck the boat is fitted with an anchor well for coastal cruising, a dedicated liferaft locker in the cockpit benches and a large storage locker with area for the stove gas bottle. A 20HP Yanmar diesel with sail drive and folding propeller is also standard. For more information visit the interactive site at www.teamfirst30.com/. The First 30 will make its North American debut at the United States Sailboat Show taking place October 7th-11th in Annapolis, MD. Smile & Wave in Puerto Rico for the 2010 Vela Cup. from Leighton OConnor on Vimeo. Our service team has been working diligently to prepare and commission the NEW FARR Designed First 40 (Hull #44) that we have in stock (stay tuned for some neat You TUBE videos of that). We thought we would share a video to pump you up for our official introduction to the Lake Michigan area. The Boat is brought to you exclusively by Karma Yacht Sales your Platinum Lake Michigan Benteau FIRST dealer. She is the only First 40 available for delivery in the United States this Spring/Summer season. To see Hull #44 request more informatio via the links below. View more presentations from first30. 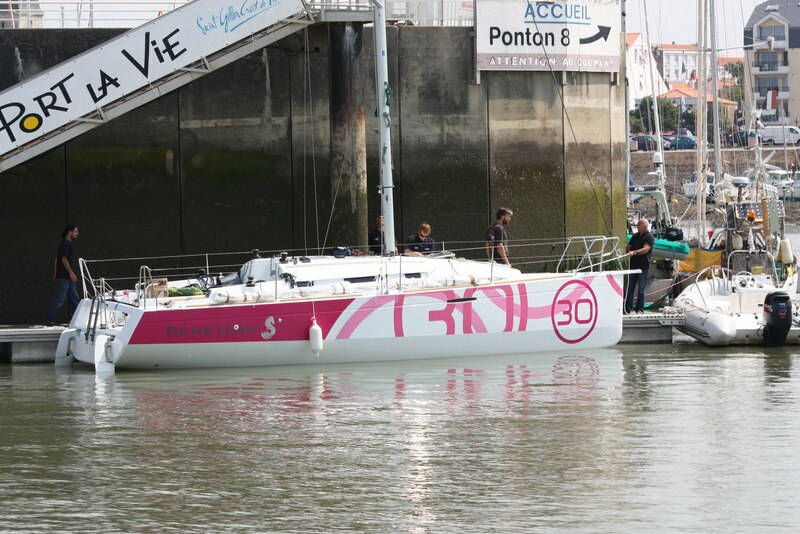 The exciting new Beneteau First 30 was unveiled to the International Beneteau Dealer's Meeting . The latest undertaking from the World's number one manufacturer of boats was designed by Naval Architect Juan Kouyoumdjian (or "Juan K" for short). Best known for his renowned designs that won accolades during the Volvo Ocean Race. 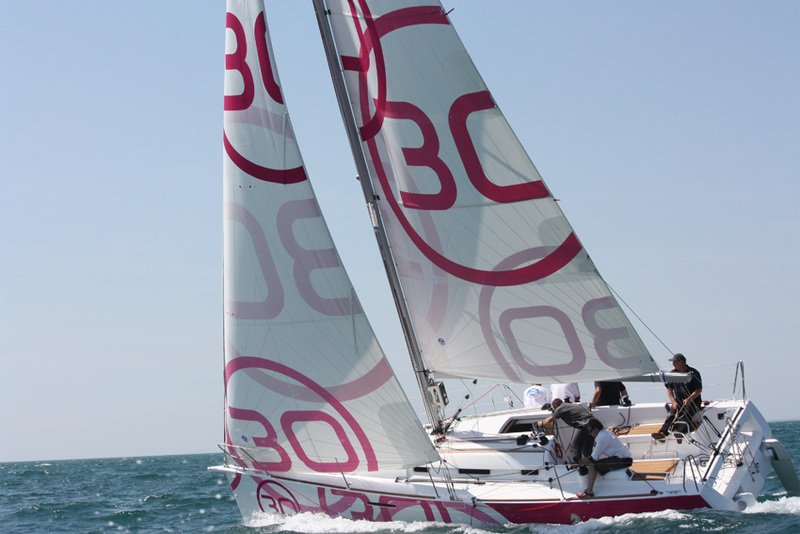 The First 30 represents an exciting new offering during an even more exciting time for Beneteau. 2010 is a year that will bring many more 'revolutionary new ideas' to the sailing industry and this is just the first of them. We are looking forward to learning more about the New First 30 and hope to see her live at the United States Boat Show in Annapolis, MD this October. For now- you can tour her in 3 dimension on the interactive Designer's blogsite. Social media is in full force with this launch- you can 'FAN' or Follow the First 30's design progress and Launch on Facebook or Twitter. As your Platinum Lake Michigan Beneteau First Series Dealer, you can bet we will have one in stock as soon as we can. To Request more information follow the links below. ne of the items often neglected on boats during the start of the season until a breakdown occurs is routine winch maintenance. Enclosed is a handy video that breaks down part one of servicing your own Lewmar Winches. The 2010 SAILING WORLD Chicag NOOD Regatta came to a close today under a last minute rainstorm from mother nature. Sailors, weary from a weekend of rain delays and light breeze saw mother nature punctuate the weekend as the skies opened up for one last shower almost as if to say- "Ha!". Beneteau had a very solid showing at the regatta. "First Series" boats had some of the largest one-design fleets in the regatta. We'll summarize them in order of size for our recap. The First 36.7 Lake Michigan Fleet had the second largest showing of boats in the regatta. The sixteen boat section has grown into one of the most competitive One-Design classes on Lake Michigan. The Lake Michigan Championship Series is comprised of the COLORS, NOOD regatta, Chicago Race to Mackinac and Verve Cup. A series champion is crowned based on point totals for competitors in the series. This weekend saw a variety of weather ranging from light intermittent breeze to 22 knots of wind and rainstorms that peppered the fleet throughout the three day regatta. On Circle B- Dan and Peter Wright's 'MAGGIE MAE' put on a clinic for the fleet running an almost perfect 1-1-1-1-1-2 for the series. The 2010 season marks "MAGGIE MAE's" second season in the competitive fleet. The competition was much tighter than the 'picket fence' finish might indicate as the lead boats changed hands on varied windward /leeward mark roundings. The Wright's nearest competition was Bob Foley's "Tried and True" (last year's NOOD champion) with 21 points and Steve Pelke's 'Stingray' just a mere 7 points behind. In one-design action for the sister fleet of 40.7's, it was Robert Vickery and Chris Jungmann's 'Collaboration 2' that had the top showing winning by a mere 1 point advantage (21) over Fleet Captain Ron Buzi'ls 'Vayu'. Tied for third place were Team MOJO and Tom Weber's 'La Tempete'. 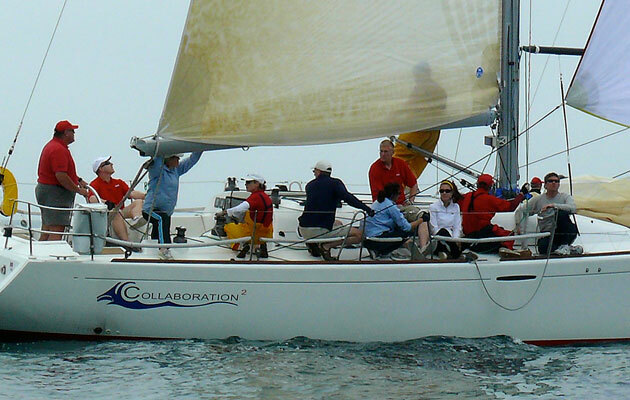 Vickery and Jungmann's 'Collaboration 2' went on to win the 'OVERALL' spot for the Chicago NOOD regatta. A great honor for the veteran racer Vickery who is no stranger to the winner's podium in many of the key local regattas such as the Race to Mackinac.